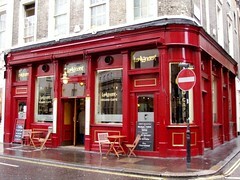 A 'Grand Cafe' serving a wide variety of Belgian and Dutch beers, in Covent Garden. There are two levels, with a large number of long tables on the ground floor, a leather-banquette booth at the back of the room, and a mezzanine level (which can be booked out, though they can also reserve tables downstairs). It gets very busy on weekdays after work, and on a Saturday evening in January 2009 was full, though on a Sunday there was still enough room for our growing group of 8-12 to move tables. Saturday lunchtime is also less busy than one might expect. The atmosphere on the whole was pleasant, though all the drinks are ordered via table service, which can be a bit slow at times (they only had a few staff serving the whole pub), though it wasn't too much bother until it came time to work out the bill (they had charged us for a couple of extra drinks we hadn't had in the end, but happily took them off when we pointed this out). This also means that a 12.5% service charge is added. There's certainly no shortage of beers (though no real ales). They have 14 on draught, which on a visit in April 2008, were Brugse Zot, Le Gauloise Blonde, Du Bocq Deugniet, Grolsch Weizen, Palm Speciale, Captain Cooker, Steenbrugge Brune, Het Kapitell Pater, Mort Subite Kriek, St Louis Peach, Leffe, Hoegaarden, Amstel and Stella Artois, and which change regularly (very few were the same in August 2009). They also have a menu booklet with all the bottled beers. Prices are high as one might expect (330mL bottles are around £3.50-5), but all are a high quality, and the waiters are able to make recommendations, including beers which aren't on the menu. They do a 'tasting stick', with either three third-pints (for £6.60) or six third-pints (for £13.20), and you can choose whichever beers you want from the fourteen on draught. Food is served noon-10:30pm Monday to Saturday, and noon-9:30pm Sunday. Food follows standard continental options, with plenty of meat and cheese, but also vegetarian options. Their double-fried Dutch fries were £3.50, served with a tasty spicy ketchup. Ewan's croque gazond (the vegetarian option) was a typical croque-style sandwich but without the ham (spinach instead), and with an extra fried egg sunny side up on top for 50p more -- quite tasty; in August 2009, an aubergine foccaccia was also very tasty, with plenty of cheese and some very stringy fries photo. They also do bowls of 'double-fried' chips with mayonnaise and spicy ketchup on the side for a reasonable price photo. Last visited by bob, June 2015. Opening hours and food times taken from Time Out website, April 2008. Last edited 2015-06-28 14:43:49 (version 8; diff). List all versions. Page last edited 2015-06-28 14:43:49 (version 8).